I little hard the last 1.5 or 1 inc on the end off the paper other wise is a good item. Great product. I bought this paper cutter to cut large photograph prints and it works great. I use 13" x 19" print paper frequently and I can trim either direction when the image is not edge to edge. It is very easy to trim a 12" x 18" print out of the 13" x 19" paper. There id no damage to the print in the process. Outstanding with easily fixed minor problem. After receiving it I did some test cuts using photographs. Cuts were clean and I'm very happy with it. I tried to reproduce the groves on the surface of photographs mentioned by another reviewer but I did not see this problem. The minor issue I had was that the movable paper guide has magnets underneath, one of which fell out. This may have been caused by the very cold weather, but was a quick and simple fix with a dob of glue to put it back in place. Welcome to MyBinding video. 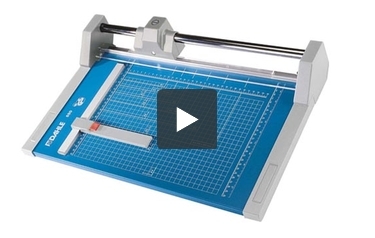 This is a look at the Dahle Model 550, a professional rolling trimmer. With ample measuring tools and an easy-to-use fence, the Dahle 550 is a great trimmer. Your settings will be locked down and precise with every cut. With a roll trimmer, you can slide both from the left to the right as well as from the right to the left. The Dahle 550 claims to cut up to 20 sheets of 20lb paper per trim. We gave that a try. Here's ten sheets done easily enough. However, when we doubled that to 20, we made it through but it was a bit rough. Really, you should think in terms of 15 sheets of standard paper at the most. Another nice features of the Dahle 550 is that it can be wall or table mounted for security as well as for stability. And that's the Dahle 550. For more demos, reviews, and how to's of this product and many more, check out MyBinding.com. Selecting the right rolling trimmer is easy when you know what to look for. One that’s definitely worth some consideration is the Dahle 550 Professional Rolling Trimmer. Here’s an in-depth look at its strengths and weaknesses. The Dahle 550 is a good trimmer to use if you want to process a fair amount of paper at one time. It can cut up to 20 sheets at once. You can use this trimmer to cut paper that’s up to 14 inches long, including letter- and legal-sized sheets (8.5” x 11” and 8.5” x 14”). This cutter has a self-sharpening blade that’s made out of ground steel. The blade will sharpen itself and it can cut in both directions which makes this device really easy to use. Plus, you won’t get injured when cutting because the blade is stuck inside a piece of plastic for your protection. If you need to work with a big roll of paper as opposed to a stack of sheets, you can attach a roll holder to this trimmer. Having this option gives you a lot of flexibility and the ability to work with different kinds of paper. You can choose between using standard or metric measurements when cutting with the Dahle 550. The base has a grid with both systems printed on it for your convenience. (If you need to cut on an angle, there’s even an imprinted protractor.) Also, the base is very durable because it’s made out of metal. The Dahle 550 has a paper clamp and an adjustable backstop. The clamp will hold your materials in one place when you trim them, saving you time because your cut will be more accurate. Since this trimmer measures 21-3/4” (width) x 14-1/8” (length), you may find that it takes up too much room on your work surface. If that’s the case, you can mount the cutter to the wall to free up some space. The Dahle 550 comes with a limited lifetime warranty. Not only does this ensure that any needed repairs will be taken care of, it shows that the company really believes in its product. This device is meant for medium-sized documents and not wide-format ones (i.e. blueprints, etc.). You should pick out a different cutter if your work tends to be pretty large. Overall, the Dahle 550 Professional Rolling Trimmer would be an excellent choice if your company or organization is looking for a high-quality paper cutter. It has a decent cutting length and it’s handy that you can use rolls of paper in addition to sheets. Plus, this product is well-made and it’s backed by an excellent warranty. If you want a device that’s on the cutting edge, take a look at the Dahle 550 today. Do you have Scoring Blades for these professional series cutters? And if so, is the switch from cutting to scoring easy to make? Thank you for your question. We reached out to Dahle and unfortunately there is not a scoring "blade" available for the Model 550 Professional Rolling Trimmer. We do ship direct to Mexico. If you add your item to the cart and put in your postal code and country, it will give you shipping costs. On the Dahle 550, how many cuts do you get before the blade needs replacing? and do you sell replacement parts for this trimmer? Thank you for your question. Due to the number of variables, such as type of stock that is being cut, Dahle is not able to quote a specific # of cuts that can be done before needing to replace the blade. We do not stock parts ourselves but we are able to order replacement parts if needed directly from Dahle for this cutter.